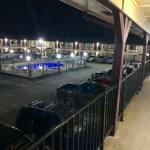 Fort Parker State Park is 8 miles from this motel in Mexia Texas. An outdoor pool on-site restaurant and guest rooms with free Wi-Fi are available. A microwave and fridge are in each room at the Inn at Mexia. Each warmly decorated room includes wood furniture and a work desk. A 24-hour reception is offered at the motel. Guests also have access to a launderette on the property. Lake Mexia is 15 minutesâ?? drive from the motel. Parkview Regional Hospital is 5 minutesâ?? drive away from Mexia Inn.